You mean USC Crimson, with gold sidewalls on the tires? I didn't know Aggies used USC as their backup school to cheer for. Yeah, I was wondering about those grips. 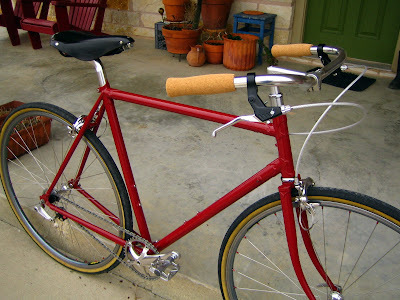 I want to see the closeup with the little Longhorn emblems show up in those burnt orange grips. Very very nice. Yet another classy ride in your stable. I it serves you well, and brings many great rides, and reflection. Beautiful. 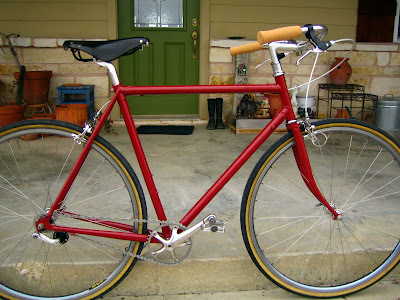 The Kogswell is reborn, and in fine form. Looking forward to hearing how this setup works for you. I love the color of your AHH ... but I'm not a sports fan, so I wouldn't have even thought about the potential problems there. All joking aside, that's a pretty ride. Props to your ability, sir. Very tastefully executed. It's a fine looking bicycle. The bike looks great! I'm sure that you'll like the bars. I like the orange Homer. Oh, got the color comment. And no, I wouldn't think Aggie fans would appreciate the near-burnt orange. As for the project, looks great. I love this re-engineered solution instead of more consumption, per your message.